#4: Hacked clients, illegal modifications, and macros are strictly disallowed, no exceptions. #5: Abuse of bugs or glitches is disallowed. (Example: Duping). #6: Inappropriate buildings are disallowed. #7: Inappropriate claiming (claiming right next to someone just to annoy them) is not allowed. #8: Inappropriately naming items is not allowed. #9: Inappropriate faction Tags/Titles or Descriptions are disallowed. Supports 1.7+. However, it is recommended to use 1.8 for the best experience. Main world size is 25,000 x 25,000 blocks. Spawn is at 0,0 and expands 12,500 blocks North, East, South and West. There is a resource world - /warp resources. This world is 3,000 x 3,000 blocks and resets on a weekly basis. DO NOT build homes or bases there as this world is only for collecting resources. All players may use the resource world. The Nether is 10,000 x 10,000 blocks. Building is disabled near 0,0 to prevent nether portal griefing. Please remember that you cannot obtain natural spawners here. The End world is disabled. Sell items in the Auction House! /ah help - Shows you all of the /ah commands. /ah - Opens a gui of current things being sold in the auction house. /ah selling - View the items you are currently selling. /ah expired - View your expired items. You can return the items back to your inventory. All players can earn money by killing mobs. Hostile mobs provide higher cash values than passive mobs. Mobs from spawners also drop money when killed. Killing mobs at night gives you 1.5x more money than killing mobs during daylight. Use /warps for a warp gui. Complete daily missions with /missions to gain MHexp. Public animal and mob farms for all players at /warp farm and /warp mob. Use /wild or /wilderness to teleport to a random location in the main world or resources world. 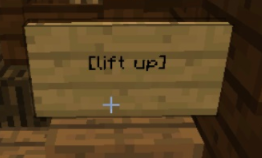 New lift up and lift down signs for Hero+ Ranks. (Very useful to teleport between farms, building levels, etc.) All players can use them. However, a ranked player has to place them. New chairs plugin - all stairs work as chairs. Use /toggles and select the 'chairs toggle' option to enable/disable the chairs plugin. Right-click the stairs to use as chairs. New! Boosters were added as a temporary server-wide boost! More booster information Here! PvP is disabled everywhere except at /warp pvp. Lava flow and fire spread are disabled. Flint and steel is disabled except on netherrack. Crafting hoppers is disabled. Buy them from /shop or trade other players. TnT and creeper explosions enabled but damage disabled. You can build in the wilderness, but it is recommended to claim your builds for protection. Faction claiming is only enabled in the main world and nowhere else. Power increases 1 per minute. You do not lose power on death. There are faction limits. You may have up to 130 faction members and 12 allies. Enemying and overclaiming another faction is disabled. Mobs and animals cannot be killed in a faction claim that you don't own. Item frames cannot be destroyed or rotated in faction claims you don't own. Factions can set 5 faction warps using /f setwarp (it costs $5,000 to create a warp). Warping is free. AutoLeave (how long it takes to kick inactive faction members) is set to 30 days. /f claim line limit increased to 5 chunks. /f unclaim [radius] - Unclaims faction land by radius. /f sc - Shows you the chunk you are standing on. Good for previewing claims. /f owner [name] - Sets ownership of a claimed chunk to a player or group of players. Useful to prevent inside griefing and betrayal. Use /f owner to set the land ownership for yourself. Slime blocks cannot be pushed in faction territory. You can change what faction members and even other Factions can do in your faction claims with faction permissions. Alternatively, you can open the /f perm gui for a slightly more quicker way to change faction permissions. You can get paid for doing things that you enjoy doing in Minecraft with the "Jobs" feature! Type /jobs join to choose out of the nine different jobs (you can join up to 3 jobs total). Woodcutter - Earn money from planting trees and chopping them down. Miner - Earn money from mining minerals and ores. Builder - Earn money from building structures. Farmer - Earn money from farming crops such as wheat, carrots and potatoes. Hunter - Earn money from killing mobs. Fisherman - Earn money from fishing at a pond or lake. Weapon smith - Earn money from crafting/repairing weapons. Brewer - Earn money from making potions using a brewing stand. Enchanter - Earn money enchanting items with an enchantment table. Depending on the job and how well you do at it, you can make a lot of money from doing the things you love! All skills are capped at level 5000 with the exception of a few. All player combat McMMO skills are disabled, which means all skills apply to farming or mobs. All players can create their own shops to sell their items for other players to buy that might be at a cheaper price than the main shop. You can also make a chest shop that allows players to sell items to you. Chest shops cannot be opened by anyone but the owner of the chest shop and staff. Right-clicking your Chest Shop sign as an owner will open up the shop. You can still add or remove items in the chests shop. 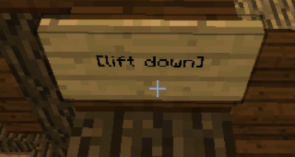 We support name changing so if you change your Minecraft name your chest shop will still work. Line 1- [your name]. Alternatively, you can leave this empty and it will auto-fill your in-game name for you. Line 2 - The amount of the item you want players to buy or sell. Line 4 - The name of the item to buy or sell. To add more members to the chest protection, select the sign by left-clicking it, then type /lockette [line-number-of-sign] [name]. Example: /lockette 3 JoshK_ will add Joshk_ to my chest protection and allow him to access my chest. (Note: This will not allow added players to edit or remove your locks). Type /lock to view all the blocks you can protect with Lockette signs! When requesting to have a player's Lockette sign or chest shop sign removed, the owner of the sign must be offline for at least 30 days before the sign can be removed by staff. This helps ensure that no items locked in these chests are stolen from active players. However, you may request and be granted a sign removal if you have changed your username or if you know for sure that nothing is in the chest. Ranked members have access to a plots world where they all receive access to 1 plot. The plots are 50x50 blocks big and can be used for farming, private storage, shops or building houses for yourself. /plot auto - Claims a plot automatically. /plot claim - Claims the plot you are standing on, if not already claimed. /plot home - Teleports you to your plot. /plot visit [name] - Teleports you to a specific player's plot. /plot add [name] - Allows a player to build on your plot while you're online. /plot trust [name] - Allows a player to build on your plot even when you are offline. /plot remove [name] - Removes build power from a player previously added or trusted to your plot. /plot clear - Clears your plot. /plot biome [biome] - Change the biome of your plot. /plot merge - Merges two plots together. /plot unmerge - Unmerges two plots. /plot merge removeroads - Removes roads on merged plots. A custom world has been prepared for the Survival reset. The world size is 25,000 x 25,000 and contains various structures, new mountains, hills and unique biomes! The nether world will no longer reset and claiming and placing spawners has been enabled in the nether. Faction Access - You can now give players or Factions access to chunks in your faction. No longer can you just grab any spawner and change it to whatever you want. You have to pay for it. You pay through EXP and in-game cash - There is no longer a cool-down due to this significant change. Changing spawners is done by right-clicking it or punching the air with the spawner. Hero+ Ranks can change some spawners. Crafting Spawners: - This idea was originated by Napkinz and developed over time. Players can obtain mob heads through the berserker custom enchant, vote rewards, mob arena, crates, and missions. These mob heads can then be used (along with the default pig spawner) to craft mob spawners. Upgrading Spawners: - Players are able to increase the spawn rates of their mob spawner, experience boost & unlock new mob drops. Players will need to pay a fee to upgrade their spawner and the fee will increase as the spawners level increases. Some spawners can reach a maximum level of 5. Use /pwarp set [warp #] [password(optional)] to set the location of where you want the warp. Donors have access to more warps, view the rank permissions at /warp ranks. Example: /pwarp set 1 oranges will set my 1st warp with the password oranges. /pwarp - Displays the list of commands you have access to. /pwarp list - Displays the list of public player warps. /pwarp show - Shows your personal warps, coords and set passwords. 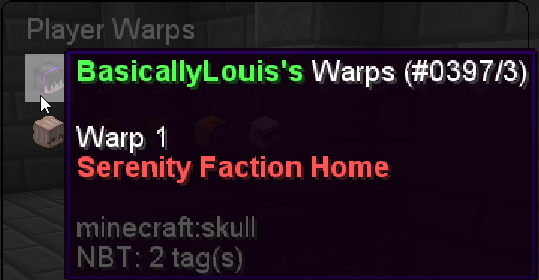 /pwarp description [warp #] [desc] - Sets a description for your warp. Gyra+ can use color in their description! /pwarp warp [player] [warp #] [password(optional)]- Use this command to access other players warps. You can also warp to players by clicking the players head in the /pwarp list. Backpacks are effectively extra inventory slots for storage while mining. All players will be able to access the first row of their backpack for $15,000 (in-game money). The glass panes are a feature to upgrade your current backpack, each costing more money. The backpack has limited space, it is essentially another private vault, but items will go into it automatically when your inventory is full. To upgrade your backpack, execute the command /backpack and you will see grey glass panes representing a row of space which can be purchased using in-game money. You can access the /backpack GUI with the /bp alias. ButterflyBliss, JakeCorbi12, Nitricity and 3 others like this.